We call this a big day because if the leaders of the Boston archdiocese manage to pull off this sleight of hand, magician David Copperfield might find his illusion of making the Statue of Liberty disappear quickly eclipsed by a new generation of magicians at 66 Brooks Drive. We now cover what appears to many people as being the deception, the explanation/coverup, and the disingenuousness of the requests for confidentiality. We hope that by now our readers and the officials of the Boston archdiocese all agree that a search was announced, but then no real search that took place. The Archdiocese of Boston announced the appointment of a search committee to help in the selection of a new Secretary of Institutional Advancement and Executive Director of the Catholic Foundation. Is there any question that the archdiocesan leadership told everyone there was a real search underway? Did anyone see a job listing in the Chronicle of Philanthropy for the Secretary for Institutional Advancement? No. Let me tell you, in case you were not aware of the significance, if a fundraising job at the executive level for an organization as large as the archdiocese does not show up there, then it’s not really an open search. In fact, did anyone see a job listing anywhere? 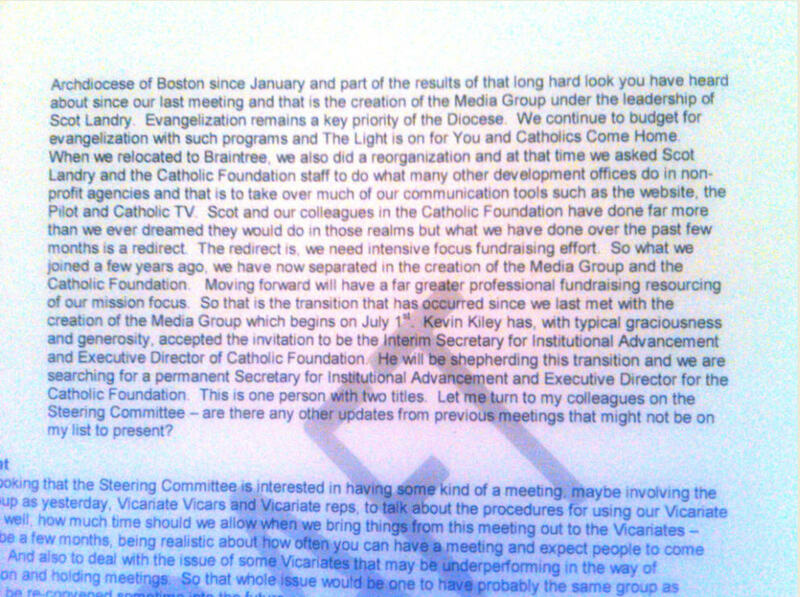 This blog also has confirmed that a move of the Campaign for Catholic Schools people from their Newbury St offices to Braintree was discussed in the winter/spring timeframe, and Kathleen’s name specifically was discussed as the choice for the job in that same timeframe by Chancellor Jim McDonough, Jack Connors,Vicar General Fr. Erikson, and Cardinal O’Malley. We know for a fact that the search committee met at the beginning of the search, and then was called back at the end when they were told Kathleen Driscoll was named to the position. There were no candidates interviewed. The dictionary definition of “deceive” is “to cause to believe what is not true; mislead.” Were we all deceived? We believe the answer is objectively yes, but you decide for yourself. The explanation being floated right now, which will probably be floated again today is that there are two “tracks” of search committees. 1) The officially announced (and apparently window dressing) version and 2) The real search (which means Jim McDonough, Fr. Bryan Hehir, Jack Connors and maybe John Kaneb with the rubber-stamp affirmation Vicar General Fr. Erikson). So, if you are asked to be on a search committee you will be told that you can search–however, at any time the archdiocese can insert themselves with the candidate. Apparently this was presented to the presbyteral council last week as the explanation, as is if this were acceptable. The way magicians perform their illusions is that they often get the audience’s attention distracted so their eyes focus in one place while the illusion happens. In this case, it is now being claimed that the public committee for the Driscoll search was told this all from the beginning. Excuse me, but even if that happened (which we do not believe), how does that explain the public announcement of the search to the entire archdiocese and to the presbyteral council on June 24? How does this explain the fact that the committee members were all outraged when they were called back in October and told the decision was made without them? Is it a plausible explanation, or an attempt to coverup the deception? You decide. The diocese that made headlines for new standards of transparency back in 2005-2006 is now asking priests and staffers to keep everything confidential. Huh? 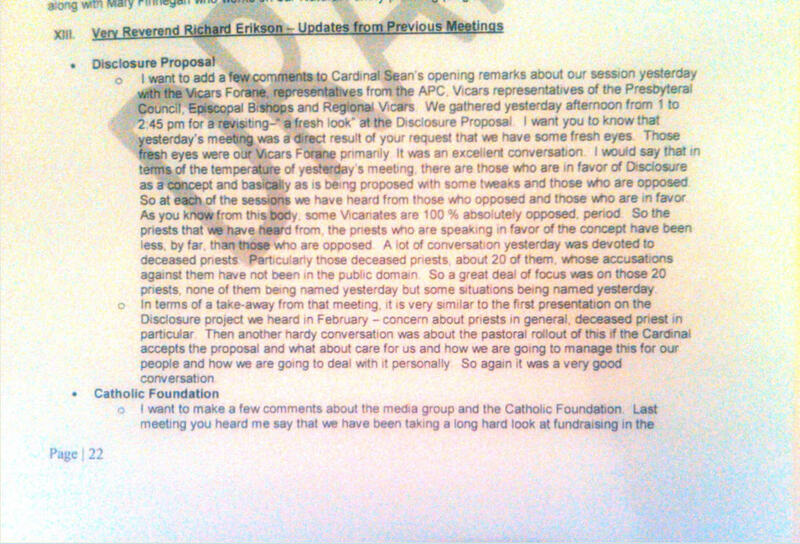 Does the diocese want transparency when they are operating with integrity, and then calls for confidentiality and secrecy when they do not want their own deceptive practices to be publicly revealed? Could someone from the archdiocese help us out with an explanation of when transparency applies and when secrecy is called for? How can the Vicar General and diocesan leadership team be “dedicated to building unity in Christ and Christian community within the Archdiocese” (as was said when they all first reacted publicly to this blog) while certain of these same leaders are operating in a way consistent with the dictionary definition of “deception”? Does anyone believe that deception as an operating principle builds unity in Christ and Christian community? Deception seems divisive to this writer. So which is it? Do you want deception, division, and secrecy? If so, then the Vicar General and Chancellor should defend what they have done, stay in their jobs and just keep doing more of what they are doing. Or do you want the sort of transparency and integrity that was touted in 2005-2006 (and quickly disappeared) that is at the foundation of building trust and unity in Christ? If the latter, then something big needs to change. A grave betrayal of trust has just occurred in the Archdiocese of Boston. Peter and Judas both betrayed Jesus. One acknowledged the betrayal and repented. The other did not. Which sort of outcome do you want to see for the sake of the future of the Archdiocese of Boston? ps. If anyone from the archdiocese disagrees, thinks we have bad information or are jumping to the wrong conclusion, please drop us a line with more details and we will be glad to correct any inaccuracies. We wrote to Fr. Erikson and Terry Donilon last week to ask a few questions and have not heard back yet. This entry was posted on Tuesday, November 9th, 2010 at 8:06 am and is filed under Archdiocese of Boston. You can follow any responses to this entry through the RSS 2.0 feed. Both comments and pings are currently closed. 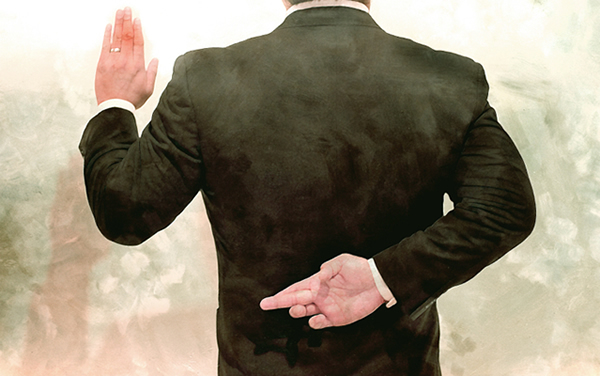 14 Responses to Diocesan Deception and Coverup? Amen to that. But we must also guard ourselves against hypocrisy. Lately, one of the Boston Catholic blogs has been allowing comments in favor of Fr. Leonard Feeney who was excommunicated by the Church for disobedience and who rejected the Church’s teaching vis a vis the dogma which says outside the Church there is no salvation. Liberals who notice the promotion of Feeneyism are sure to use this as a weapon against magisterial Catholics if this is not nipped in the bud now. Leonary Feeney was reconciled to the Church (with the Help of +Bishop Lawrence Riley) and never required to abrogate his statements because the Church still teaches “Extra Ecclessia Nula Salus”, just with far more finely nuanced Theology. Liberals also tend to be poorly catechized so they likely would have no clue who Feeney was. Feeney’s interpretation of the dogma was summarily rejected by Rome. We should refrain from trying to “correct” the Catechism of the Catholic Church or papal teaching. I think that’s what BostonMagisterialCatholic is saying and I agree. How can we condemn dissent from liberal corners and embrace dissent which emanates from so-called “traditional Catholic” circles? Thank you for agreeing with our statement about the betrayal of trust. We hope that nothing about this blog is suggestive of hypocrisy (though we are sure you will let us know if/when that happens), and we cannot speak for what is posted on other blogs. As readers can hopefully see from the list of topics posted yesterday, we barely can keep up with our own blogging here. If there is a different blog where a discussion is taking place that you folks here acknowledge is not relevant to this blog, please make it easy on us and just keep the discussion at the other blog. We have plenty to do keeping up with the email and comments generated by our own posts. Towards that end, the topic of today’s post is Diocesan Deception and Coverup, and it concerns the deception by archdiocesan officials in what was said and done in the search and hiring of a new Secretary for Development. If people have comments they would like to add related to this topic, please feel free to do so here. If not, it is OK to simply read the post and pass the message along to others who are interested in this topic or other governance-related topics. There are two tracks all right. The choo choo is on the way to Maplethorpe. Where is the mention of the 2 tracks in the press release that announced the search? Or in your remarks to the Presbyteral Council? If this wasn’t a sham search, do you think the people on the search committee agree with your assessment? If so, it would be great to hear from them. It’s tough to believe they were told or understood that a separate track would be done outside the work of the committee. Why would talented and busy people sign up for the search committee if they thought their work would be wasted by a second-track search? How dumb do you think the priests, employees and caring lay faithful are? Here are the facts: Connors is appointed the chair of the search committee. He never calls any substantive meetings. People that email in their resumes are told to forward them to the Chancellor’s office. No response is ever sent to the candidates and no one is ever interviewed. Then the person (Driscoll) who has been working for Connors for years is appointed to the position four months into the “search”. If it looks like a sham search, smells like a sham search, reads like a sham search … it IS a sham search. Shame on you Rich for stating that it is anything other than a sham. Jack having a little fun at the expense of those who agreed to serve on the search committee is infuriating. Jack having a little fun at the expense of highly qualified candidates who had hoped this would be the ideal opportunity to offer their expertise and devotion to the Church, but were in fact ignored, is a grievous sin. Richard Erikson is not heartless, but this demonstrates once and for all that he is voiceless. Rich, reluctantly I have to join the chorus at this point: Go back to the Air Force. Now. Two people OKed the sale: Martha from Jack’s vest pocket where she is snug and re-elected, and a judge who reports to Martha and did as he was told. Newsflash to Ralph and Jack: You don’t have to thank people you own, just ask Thomas Jefferson. While I realize deception = deception … I do think the deception or “cover-up” can be seen as weighted differently when one considers the possible reasons for the cover-up. I think the Father Feeney reference is for a different forum, viz. the forum of theological debate. Sorry to say, within my experience as a priest of the RCAB, I have been suspicious of this kind of deception and the facilitation of crimen in more than one situation and was powerless to challenge it though I believe I have been subjected to retalition by twisting my personnel files to render me incredible should I ever attempt to challenge these situations. Verbal gymnastics, deception and PR doubletalk are tools of the trade in all corporations … cORP sOLE IS NOT ALONE, SORRY TO SAY. There is pandemonium at the Chancery. The dogma extra ecclesiam nulla salus (outside the church there is no salvation) says everyone with no exception needs to be a formal member of the Catholic Church for salvation. He agreed this was the teaching of the dogma and of the Catholic Church. Every non Catholic needs to enter the Church for salvation.” If there is no baptism there is no salvation “,said Fr. Gabrielle.It needs to be mentioned that Catholics only give the baptism of water to adults with Catholic Faith (Ad Gentes 7). Ordered to stop teaching his interpretation, Feeney refused and was excommunicated, not technically for teaching heresy but for disobedience. Karl Keating says that Fr.Leonard Feeney was not excommunicated for heresy but he held the ‘rigorist interpretation of the maxim “extra ecclesiam nulla salus”. It was not a maxim it was a dogma Mr.Keating and the dogma held the ‘rigorist interpretation’ of outside the church there is no salvation. Pope Pius XII in the Letter of the Holy Office 1949 referred to this ‘dogma’, the ‘infallible’teaching. So if Fr.Leonard Feeney was not excommunicated for heresy and held the same teaching as the dogma extra ecclesiam nulla salus, did the Letter of the Holy Office to the Archbishop of Boston support Fr.Leonard Feeney on dogma/doctrine ?